(TORONTO – November 1, 2013) Choose your path – on-road or off – and drive with confidence while relaxing in an interior suffused with rich leather, lustrous wood trim and advanced technology that’s rare to find in a seven-person mid-size SUV. The 2014 Lexus GX 460 is powerful and athletic, with a fresh, bold look for 2014 – and enhanced suspension system for even greater performance and handling in all weather and road conditions. What’s more, every model comes with a standard features at a new, lower suggested retail price – making it even easier to experience the luxury and freedom of the Lexus GX 460. 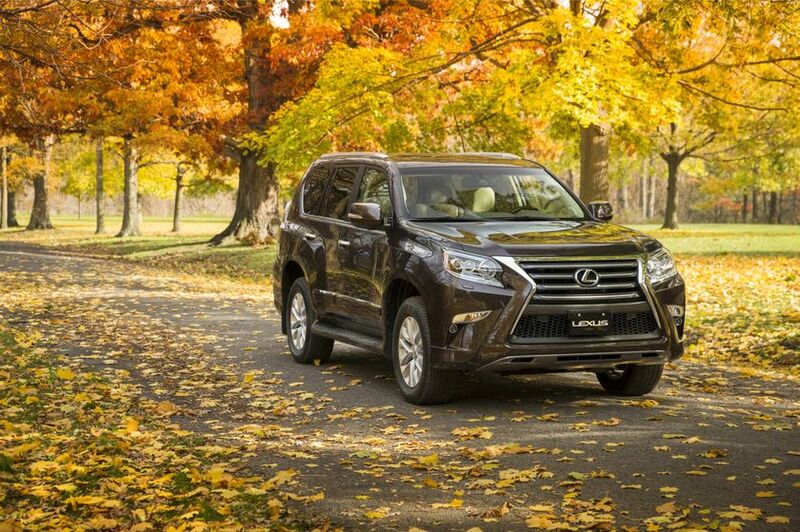 Every Lexus GX 460 features extensive new styling for the 2014 model year. Outside, the signature Lexus Spindle Grille makes its debut on the GX, enhanced with new front bumper plus LED low-beam headlamps, LED daytime running lights, and LED fog lamps. At the rear, the GX receives a new bumper design plus new combination lamps and back-up lamps. The result is a rugged and powerful exterior that conveys the appearance of a vehicle artfully forged from a single block of metal. The GX’s powerful stance is enhanced with 18” aluminum alloy wheels with locks, chrome finished door handles and rear trunk trim, roof rails, illuminated running boards, integrated signal lamps, a power moon roof and a rear spoiler. Under the hood, a 301 peak horsepower 4.6 liter V8 is enhanced with Dual Variable Valve Timing with intelligence along with other technologies to maximize available power and efficiency across a broad speed range – plus a heavy-duty battery, starter, alternator and heater to ensure reliable performance in Canadian winters. This engine is mated to a six-speed super ECT automatic transmission for responsive shifting and acceleration, plus a fuel efficiency of 12.2 liters per 100 kilometers (city/highway combined). Every GX 460 features a full-time 4WD system, plus hill-start assist control and downhill assist control. The suspension system is surprisingly comfortable on the road, but fully capable on the trail – featuring an independent, double wishbone front suspension and four-link rear suspension enhanced with the Kinetic Dynamic Suspension System, featuring upgraded components for 2014. The GX enjoys a ground clearance of 8.1 inches. The result is the GX 460 enjoys go-anywhere performance plus refined road manners. When adventure calls for towing, the GX is ready, with a 6,500 lb (2,948 kg) towing rating, a new trailer sway control brake system, plus 4-pin and 7-pin trailer wiring harness. Inside, the GX is intentionally sturdy yet polished to an elegant finish, featuring plenty of thoughtful in-cabin storage and remarkable versatility: Reclining 2nd row seats feature a 40/20/40 split folding seat back while the 3rd row seat is split 50/50 with a fold-flat mechanism. The front-row seats are eight-way power adjustable, while the driver’s seat features a memory system with two settings. A newly designed centre cluster exemplifies the GX’s strength and prestige. The instrument panel – seemingly forged from a single bar of metal – is juxtaposed with the softness of leather and warmth of mahogany wood trim. Instrumentation includes an ECO drive indicator, organic LED multi-information display with Lexus customizable features, trip computer, cruise control, and electroluminescent instrumentation gauges. The 2014 GX is fully equipped with active and passive safety systems to protect driver and passengers. These include 10 airbags, clearance and back-up sensors, a back-up camera, on-board first aid kit, plus powerful front and rear ventilated disc brakes enhanced with antilock braking system, brake assist and electronic brake force distribution. Other safety technologies fitted as standard include active traction control and vehicle stability control. Two 330-watt audio systems feature 7.1-channel surround sound architecture, Bluetooth connectivity, USB audio inputs, integrated XM Satellite Radio and steering wheel-mounted audio controls. Other standard features include: power door locks with keyless entry; power windows with auto up/down function for all windows and window jam protection; integrated garage door opener; tonneau cover; illuminated entry system; the Smart Key System with Push Button Start; 12v accessory power outlet and 120v/100w power outlet; anti-theft system with engine immobilizer; dual heated exterior mirrors linked to seat memory system; the automatic headlamp system; variable intermittent, rain-sensing wipers; and more. The 2014 Lexus GX 460 (starting MSRP $58,900) features a 9-speaker Lexus Display Audio system, dual zone air conditioning, leather seat surfaces and a leather-wrapped steering wheel. This model’s starting MSRP is $3,600 less than the 2013 model is replaces. The 2014 Lexus GX 460 Premium (starting MSRP $66,600) is equipped with an enhanced rear suspension featuring a load-leveling air suspension and active ride height control. Other upgrades include a 17-speaker Mark Levinson Premium Audio system, three-zone independent automatic climate control, semi-aniline leather-trimmed interior, wood and leather-wrapped steering wheel and shift knob, voice-activated hard disc based navigation system, heated 2nd row outboard seats, power flat-folding 3rd row seat, illuminated “Lexus” scuff plates, the Lexus Blind Spot Monitor and Rear Cross Traffic Alert systems, power retractable exterior mirrors, and headlamp washers. This model’s starting MSRP is $2,550 less than the 2013 model it replaces. This model may be enhanced with the available Ultra Premium Package, which adds: transmission cooler, 4-wheel crawl control system, multi-terrain select system, unique alloy wheel finish, heated steering wheel, rear seat entertainment system, the Lexus Pre-Collision system and driver monitoring system, lane departure alert, dynamic radar cruise control, the wide-view front, rear and side monitor system, and a front console cool box.